Strathisla has been around for so long (its roots go back to 1786) there’s bound to be a few dark moments in its past. As an appreciator of dark moments, one of my favorites is the brief period of 1940 to 1949 when the Strathisla was owned by a fairly slimy Londoner named Jay Pomeroy…or Jay Pommeroy…or George Pomeroy, depending on the source. This guy purchased a majority stake in William Longmore & Co. in 1940, effectively grabbing ownership from the (more or less) family business that had run the distillery since 1830. Pomeroy capitalized on the shortage of mature whisky stocks at that time not by being an honest whisky-businessman, going above the board, paying all the expected taxes, and reporting all the subsequent income to the crown. Nope, Ol’ Jay or George or whatever decided to sell off a great deal of Strathisla matured stock on the black market, thereby making a lot more money. That he did this during WWII and the lean post-war years just adds to the sliminess, but fear not, justice is coming. While Pomeroy might have been clever enough to make more money on the black market, he wasn’t clever enough to do it in such a way that no one noticed. Near the end of the 1940’s he was jailed for tax evasion and the distillery was forced to declare bankruptcy. In 1950, Chivas swooped in and picked up the bedraggled Strathisla for a measly £71,000 (almost $200,000 at the time) and quickly set about restoring it to its earlier glory. 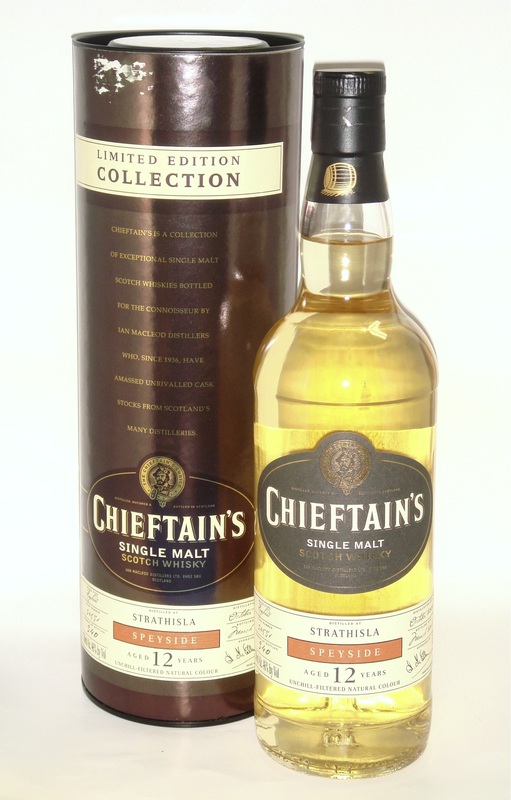 The delicious irony, if it can be considered irony, is that Chivas had been trying to purchase Strathisla from Pomeroy in 1948 before he was caught. The deal never happened because Pomeroy was apparently demanding an obscenely high price for the property. There’s a lesson in there somewhere, kids. Today, most likely, nobody really cares about Jay or George or whomever Pomeroy, whereas the distillery he once nearly ran into the ground is considered “the spiritual home” of one of the worlds biggest selling whisky brands. Make no mistake, this Strathisla 12 year old single cask expression from Ian Macleod’s Chieftain’s range is completely legit. This one was distilled in 2000, and was matured in a re-fill hogshead and bottled without chill-filtering or added color. The Nose: Rather fetching and sweet with complex cereal notes and ripe fruit; honey, chocolate malt and milky caramel with tinned fruit cocktail and juicy, Bartlett pears. There’s a bit of vanilla syrup and nutty toffee as well, along with pleasant, balanced wood notes of orange zest, soft cinnamon, and clove. Much more in the background are subtle floral hints, herbal tea maybe, dry hay, and slight tinge of mint. The Finish: Just excellent with continued cocoa-tinged sweetness and woodspice with a wonderful, slightly clove-ish wave of dry wood smoke. Thoughts: Wow…I just wasn’t prepared for this one. While the pleasant nose was nice enough and held a few surprises, I wasn’t expecting it to lead to a palate and finish that just kept getting better and better. There are a lot of delicious chocolate-y notes and complex malts notes here, but they’re just balanced so nicely with a bit of fruit and strong, but tempered oak, that it doesn’t ever feel overloaded in either direction. This is one of those satisfying, complex yet almost too drinkable whiskies that takes you by surprise a bit…you pop the cork and next thing you know you’ve cleared half the bottle. It’s easy to second guess watering a single cask release down from cask-strength, but in this case they got it oh-so-right. Excellent stuff, one of the best expressions I’ve had yet from the Chieftain’s range. Highly, highly recommended.